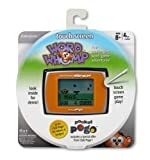 Word Whomp – Find words within words. Guess the secret word for a bonus! Hangman – Solve the mystery word by guessing the right letters. Shuffle – Unscramble words by swapping two letters at a time. Mystery Word – Guess the mystery word with 2 clues and a 5-letter lead. Really, really fun game on the Ipod touch, Iphone, and soon, the Ipad. Basically it’s scrabble over the internet. Add me, let’s play! !